Sunday’s candlelight vigil for Orlando at Lake Eola is expected to draw nearly 30,000 people, according to RSVPs made on its Facebook event page. The vigil is the next step in the healing process for Orlando in the aftermath of the Pulse attack, the nation’s deadliest mass shooting. With a gathering of such size, there will also be changes to local transportation options downtown. 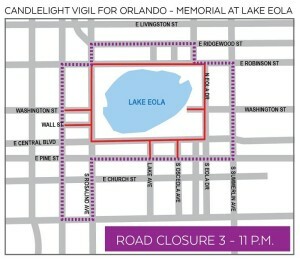 The City of Orlando announced road closures for Sunday around Lake Eola. Road closures will begin at 3pm and end at 11pm. Parking will be available in garages at a reduced rate of $4 for the vigil at the Courthouse, Library, Central, 55 West, and Jefferson garages. Governor Rick Scott also announced that the Florida Department of Transportation will be providing SunRail night service on Sunday for those traveling to and from the Lake Eola candlelight vigil. 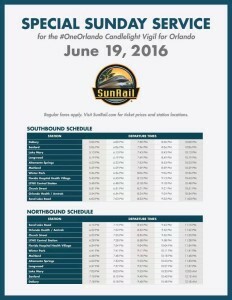 The SunRail service change was requested by the City of Orlando. The City of Orlando also announced Lynx and Lymmo will be running extended hours and offering shuttle services to the event. Please visit Central Florida Regional Transportation Authority(LYNX) for more details.